The Nihon Keizai Shimbun (Nikkei) published an article on June 17 that was critical of the Japan Business Federation (Keidanren), a lobbying organization made up of more than 1,300 of the country’s biggest companies. The Nikkei has always been in Keidanren’s corner, so it was something of a shock to read a story suggesting that the organization appears to be incapable of changing with the times. The Nikkei more than likely had high hopes when Keidanren appointed Hiroaki Nakanishi of Hitachi Ltd. to the organization’s top post in May. 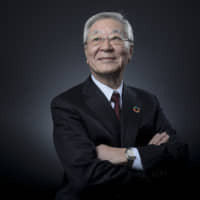 Nakanishi was credited with saving Hitachi, which Nikkei described as a “sinking battleship,” and he seemed to possess a greater international sensibility than previous chairpersons in his position. However, not much had changed. All 18 current vice chairpersons were men over the age of 60. No foreign or information technology companies were represented. Only seven had ever worked abroad. Most significantly, there were no entrepreneurs or self-made businesspeople on the board. Every member was an organization man, having worked his way up the ranks within his respective company in Japan in a conventional way — namely, the lifetime employment system wherein one climbs the ladder through seniority. The Nikkei’s position that Keidanren should enter the 21st century was prominent in another article that appeared Oct. 16, which covered a news conference in which SoftBank founder Masayoshi Son and Toyota Motor Corp. President Akio Toyoda announced a joint venture to promote new mobile services. 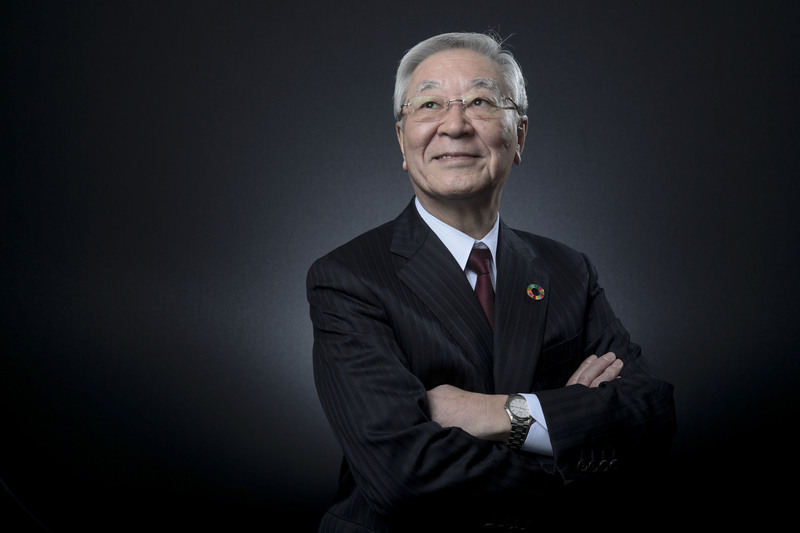 Toyoda said the venture was his company’s idea but that he couldn’t imagine entering such a field without Son’s help. Son expressed surprise that a company like Toyota wanted to work with him. The Nikkei pointed out that Toyota executives have headed Keidanren in the past but the organization has never been lead by someone such as Son, who was mostly educated in California and created his mobile communications behemoth “in the course of one generation.” Perhaps for those reasons, Japan’s business establishment has not recognized Son as one of its own. The Nikkei implied he could be the kind of chairman who would bring a progressive sensibility to Keidanren. Many students are no longer interested in joining Japan’s legacy companies due to what they see as these companies’ bureaucratic structures. Young entrepreneurs are less likely to “respect” the classic “salaryman leadership system.” Having someone such as Son in charge could mean a change in the federation’s outlook. Keidanren is obviously thinking about this matter because Nakanishi recently announced a shift in the organization’s university recruitment schedule. At present, Keidanren rules state that member companies should not invite prospective employees to recruitment sessions until the last month of their third year of study, meaning March. Job interviews in turn cannot start until the following June. Nakanishi wants to do away with these restrictions starting with the 2021 graduating class. Since more and more “excellent” students are interested in companies that aren’t members of Keidanren, the federation needs to relax its recruitment schedule in order to compete in what has become a sellers’ market. Last spring, the hiring rate for new graduates was 98 percent. As Dokkyo University economics professor Maki Fukasawa argued on a recent edition of Bunka Hoso’s “Golden Radio,” however, how can Keidanren members seriously think about attracting today’s graduates without changing a work culture that repels many of them? More significantly, the standard recruitment system, regardless of the schedule it follows, requires that new university graduates only be hired at the time they graduate, and an increasing number of companies, particularly foreign ones, don’t follow this system. They hire workers regardless of their age and whenever they want, based on the candidate’s experience and the companies’ needs. In fact, many young people these days think of their first job as a stepping stone. They aren’t interested in lifetime employment with one firm. They want to build a career and that tends to involve changing jobs. “A lot of my students now go overseas for work opportunities,” Fukasawa said, suggesting that they sidestep the whole process. Not everyone in the government is thrilled by this development. A Nov. 3 Asahi Shimbun column reported on a government-sponsored meeting that discussed the proposal to change Keidanren’s recruitment rules and concluded the present system should remain as it is in order to provide a level playing field for companies looking to hire new employees. The column’s pseudonymous author, who thinks the whole system should be done away with, points out that it’s rife with cheating. Many Keidanren members do not follow the recruitment schedule, anyway, since it is nonbinding. Companies and students who do follow the rules are at a disadvantage. Keidanren would appear to be moving forward by eliminating at least part of the system, the author says, while the government wants to keep things as they are. So do universities or, at least, private institutions, which are afraid that companies will be able to recruit students at anytime if schedule restrictions are relaxed, after which they will simply stop studying. However, that concern begs the question: Why are they studying in the first place? Keidanren’s recruitment rules are arguably self-serving and short-sighted, and while the government has always done the bidding of the business community — its controversial foreign worker acceptance policy is being implemented at Keidanren’s insistence — it also wants to maintain its authority in the area of education. Universities, on the other hand, just want to stay in business. Such a confluence of interests isn’t going to produce another Masayoshi Son anytime soon.